Ambisonics is a British-developed surround-sound system currently backed by the British Technology Group. It offers a number of advantages over conventional 'Quad' systems in the A/V and conference environments. The intention of this article is to give sound engineers in AV-production houses and those in charge of sound systems on-site in these areas, an insight into how to obtain the best results from this technology. A set of reprints of relevant articles from Studio Sound and Broadcast Sound magazines may be obtained from the Ambisonic Technology Centre in Reading; these will answer basic questions on the system not covered here, plus specific techniques which will be useful in Ambisonic music production. Ambisonics differs significantly from so-called 'Quadraphonics' in a number of ways. 'Quad' is simply a development of pan-potted stereo, spread between four loudspeakers. Localisation (the positioning of apparent sound sources in the listening environment) is achieved by level alone - which is only one of the different mechanisms used by the ear and brain to position sounds. In addition, the speakers are placed at angles close to 90 degrees, at which normal stereo effects tend to collapse into the loudspeakers. The result of this in a typical A/V environment is that sound sources are 'sucked into the speakers' and there is little spread between them. Additionally, the use of level-alone localisation means that with a large number of listeners in the room, each will perceive a different image, as a listener positioned near the front left speaker, for example, will hear mainly the sound from that speaker and little else. Ambisonics does not seek to produce four totally different signals to feed four speakers in a square. It aims instead to recreate a 'soundfield' - either a real one, captured with a microphone like the Cairec Soundfield microphone at a concert or whatever, or a synthesized soundfield created in the studio with the Ambisonic analogue of panpots. In either case, Ambisonics produces an exciting and stable surround-sound effect in which the speakers are often not noticeable as the sources of the sound. As Ambisonics uses both level and phase to localise sound sources, the image is highly stable and not nearly so dependent on the position of the listener within the listening area. Indeed, even sitting next to one speaker, the listener will still be aware of the soundfield image, even though they will appear to be closer to some sound sources than others (just as if you were close to one section of an orchestra: you would expect to hear, say, the violins louder than other instruments, but you would still be fully aware of the rest of the orchestra and the concert hall). Ambisonics is generally listened to with four speakers arranged in a rectangle (although height information can also be reproduced, with more speakers and slightly more complex equipment - this is called 'periphony' - this will not be considered here as there is little available in the way of equipment at present). The source for replay can be a 2-channel recording encoded with surround information (called 2-channel UHJ) in the form of a disc, radio broadcast or tape; or a 3-channel recording in what is known as 'B-format'. Both 2-channel UHJ and 3-channel B-format are useful in the A/V field: the exact format used will depend on the source material and the equipment available at the production facility and on-site. Ambisonics was originally developed as a domestic format for commercial recordings and radio broadcasts. There are today over 150 albums produced in 2-channel UHJ-encoded form, including several Compact Discs. In addition, the BBC have made numerous UHJ broadcasts of concerts and drama. However, the audio-visual environment is ideally suited to Ambisonics for a number of reasons. Firstly, a large number of production houses and on-site users have been working with discrete multichannel audio presentations for some time. Very often as a result, both production studios and site equipment have been based around the use of four speakers and four channels of amplification, and audio tracks have been laid on 4-track recorders with stereo front audio tracks, rear mono track and data for projectors on the fourth track. Ambisonics gives the user the possibility of encoding a complete surround-sound image on either two or three audio tracks which allows the producer complete freedom to position sounds - music, effects or voiceovers - anywhere around the listener in such a way that the intended effect will be heard by everyone in the room. If a 4-track machine is in use, then B-format can be used, giving very accurate localisation in the listening environnent. Alternatively, if desired, 2-channel UHJ can be used, leaving a blank 'guard-band' channel between audio and data and thus reducing annoying breaktrough of tone or pulses on to the audio system. 2-channel UHJ also means that surround-sound can still be used even in small installations based around 3-channel (2 audio, 1 data) 'A/V' cassette machines. In many cases, the only additional equipment required on-site will be an Ambisonic decoder positioned between the tape machine and the four amps driving the speakers: this will cost between £35 and £200. The British Technology Group also has arrangements to allow first-time users to borrow decoders free of charge to evaluate the system. Another advantage of UHJ is that it's completely mono and stereo compatible: therefore, if an Ambisonic decoder and four speakers are not available, the same audio can be replayed in mono or stereo without compromising the balance. And on a stereo system, UHJ gives a wider and more stable stereo image than conventional 'pan-potted' stereo, so it is often worth considering an Ambisonic production even if the material will only be heard in stereo. This factor will be considered later in relation to library music. Although Ambisonics has been around for over 10 years, it is only recently that equipment has become available which will enable the use of Ambisonics in audiovisual applications. Three pieces of equipment are now available, and are currently manufactured by Audio & Design Recording of Reading. They are the Pan-Rotate unit, the Converter, and the Transcoder. The appropriate units for any given production will depend on a number of factors, primarily which format is to be used for replay: UHJ or B-format. UHJ requires only two audio channels and is compatible with stereo and mono; B-format requires three audio channels and would need encoding to UHJ (simply a matter of copying the material through an encoder) to become mono/stereo compatible. By virtue of having the extra channel, B-format can give more accurate localisation of signals, and the format is somewhat more 'robust', being less sensitive to machine lineup errors. Because of the extra information encoded on a UHJ tape, lineup (especially azimuth) is a little more important than on ordinary material. If normal maintenance practices are observed, however, no problems will occur. In any event, the main effect of azimuth errors will be to affect mono compatabillty only, and this is seldom a problem in A/V production. The Transcoder is a very useful unit which will satisfy many of the requirements of A/V production, if the final tape is to be a 2-channel UHJ-encoded master. The Transcoder takes four inputs, corresponding to the four channels of a conventional 'quad' system, and places them across two 'sound stages', one at the front and one at the rear. The width of the 'stages' may be varied between 0 and 180 at the front, and 0 and 150 at the rear. The output is a UHJ 2-channel encoded signal which may be recorded on an ordinary stereo machine, or on two channels of a 4-track. This means that you can produce your material in the normal way on 16 or 24-track, laying music beds, voice-overs and effects exactly as you would normally do. When it is required to however, instead of routing the soundtrack to three groups feeding the 4-track, your route four groups to the Transcoder input, feeding the Transcoder output to two tape tracks and monitoring the result through an Ambisonic decoder driving the monitor speakers in the control room. You can pan between any of the four groups to localise a given source exactly where you require it. There are only two places you cannot place the signal: the positions between the edges of the front and rear stages. These are 30-degree sectors just behind the 'East' and 'West' directions (in Ambisonics, we refer to centre-front as 'North', centre-rear as 'South', and so on, to avoid confusion with 'Quad' speaker desinations. In addition, 'North-West' will only refer to the left-front speaker if the replay speakers are arranged in a square, and they don't have to be. The cardinal points make it easy to refer to a direction in the soundfield, and it doesn't matter if there is a speaker there or not: it will still work!). These 'missing sectors' are not in important places, however, and you will probably never notice! The effect of the Transcoder is to take a 'Quad' mix and 'transpose' it into Ambisonics, making the image you perceive at the centre of the 'Quad' listening room more stable and accurate, and experienced anywhere inside the Ambisonic listening environment. Indeed, the Transcoder was originally designed to convert 'Quad' recordings to Ambisonics, which is exactly what you are doing if you use the Transcoder for a presentation in this way. One of the most important aspects of an A/V production is the music, and this is often derived from library sources. This presents no problem in an Ambisonic presentation, as you can position stereo music material across the Transcoder sound-stages as you require. Typically, you might place a stereo music track across the front stage: thus if your front groups are 1 and 2, you simply route the music bed to them in the mix. This will spread the sound right across 180 degrees - very impressive. If you often place a piece of music across the front and a synchronised, delayed underscore to the same piece on the rear channel, you can do the same with the Transcoder, routing the main track to 1 and 2 and the delayed underscore to 3 and 4. This will give you the advantage of both front and rear stereo images instead of just a mono rear signal as you would usually get. The best delay to use will depend on your application: as a guideline, use the same kind of delay as you would use for ADTing a mono source into stereo, around 25 ms or more. Just as in ADT stereo, if the delay is too short you will get apparent localisation in the soundfield instead of a delay. Changing the delay from zero to about 10 ms will give the impression of the image rushing past your head: this may be interesting but also somewhat distracing for the audience. Until now, only stereo library music has been available. However, an Ambisonic library album - the first of a series - has now been released by KPM. 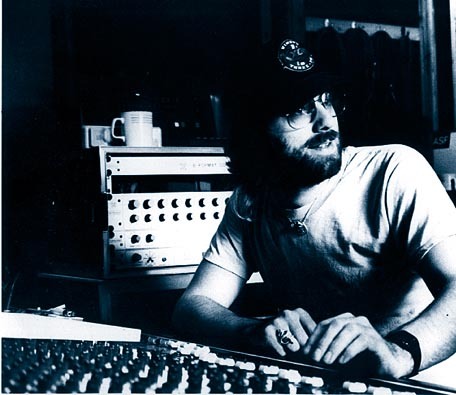 Titled Contact, this album, composed by Keith Mansfield, is the first Ambisonic library album and the first Ambisonic album to be derived from multitrack recording techniques. It is released as a normal LP and, of course, master copies are available from KPM. Both the album and the tapes are in UHJ 2-channel format, and are thus completely mono and stereo compatible. If you are producing a normal stereo or 3-channel A/V) you can treat the tracks as normal stereo: they exhibit the wider and more stable stereo image that characterises an Ambisonic recording. If, however, you are contemplating an Ambisonic A/V, the album really comes into its own. The tracks have been mixed specifically with A/V in mind, such that the rhythm tracks and most of the 'weight' of the tracks have been localised across the front, so as to be heard across the width of the screen. Percussion effects are often wider, stretching from East to West, while ambient sounds, echoes, strings, effects and the like are positioned all the way round the soundfield. This means that when replayed Ambisonically the tracks will give a great deal of clarity and dynamics, but will also create an atmosphere that surrounds the audience without distracting their attention from the visuals. In addition, this type of mix leaves plenty of room for powerful rear effects to be added by the producer without losing either the clarity of the music or the impressiveness of the effect. Tracks from this album should not be routed through the Transcoder, as they are already UHJ-encoded: they should be transferred to multitrack on their own tracks and mixed bypassing the Transcoder direct to the main stereo output to the 4-track. In other words, they should be routed to the mix bus on mixdown, through two channel faders for balancing. The Transcoder outputs should also be returned to the mix bus, perhaps through a pair of console channels, enabling the mixing of UHJ material with material encoded with the Transcoder. This is generally a simply subgrouping operation. Voiceovers and mono effects may be panned into position with the desk panpots: simply route the channel to the appropriate groups to pan across the desired 'stage'. Joysticks, if you have them, may be useful for effects: you can pan a signal anywhere in the soundfield with them, for example, panning a jet aircraft from South to North is very impressive. With two such controls, you can do it in stereo! For the time being, it is likely that UHJ will be the preferred Ambisonic format for most applications, just as it is for album and broadcast release. UHJ is easy to handle: it behaves as 'enhanced stereo' until it is replayed via a decoder, when the surround information is completely recovered. Ultimately, however, B-format offers even more flexibility on three tape channels. The other units currently available for production purposes both produce B-format signals: of course, these B-format outputs can be fed to the B-format input on the Transcoder to give 2-channel UHJ with or without an intervening B-format tape stage: the other units can therefore be used if desired for either application. However, for the majority of UHJ productions, the Transcoder will give sufficient flexibility; it is also exceptionally easy to set up and use. The other Ambisonic production units are the Pan-Rotate unit and the Converter unit, and both have specific applications. Their use in music production is covered in the article An introduction to Ambisonic mixing, published in the September 1983 edition of Studio Sound, and many of the points detailed there have applications in the A/V field. Also included in the article are detailed diagrams of typical mixing setups. The Pan-Rotate unit is basically an 8-channel Ambisonic panning unit. Eight mono inputs are provided, that may be patched out of post fade console channels. A B-format output is provided which may be used to feed other units or the tape machine. The panpots are 360-degree continuously rotatable controls, and rotating a control through the full 360 pans the sound source all the way round the soundtield: in other words, the panpot position corresponds exactly to the perceived localisation. A further 'rotate' control is provided, which can be used to rotate the soundfield created by the eight panpots as a whole through 360 degrees, enabling complex balances and localisation to be rotated around the listener for impressive effects. The rotate control may be switched in or out of circuit. Two B-format inputs are also provided, so that external Ambisonic signals from other units may be added to the panned signals. One B-format input is before the rotate control; the other after it. Production models of the Pan-Rotate unit also include an extra control adjacent to each panpot. This is a 'radius vector' control and adjusts the apparent distance of the source from the centre of the soundfield. It is a 270-degree switched control which allows the distance to be varied from '+' (the switch position, designated 'normal'), the 'edge of the soundfield, through '0' (centre), as '-', the opposite edge of the field. Thus rotatting this control through its full travel moves the sound routed to that panpot across a diameter, whose 'normal' position as determined by the pan control. Placing the panpot at zero (centre front-North) and rotating the radius control therefore pans the sound from North so South, for example. Impressive spiralling effects into and away from the centre of the field can therefore be created by rotating both controls sImultaneously. In addition, by using both controls, a sound can be positioned anywhere in the field. Whilst the Pan-Rotate unit is designed to be used for effects purposes, the other unit, the Converter, is designed for 'static' localization: ie, sources which are required to remain stationary (or nearly so) during the performance. The Converter enables the console panpots to be used to pan a sound across one 90 degree quadrant of the soundfield. To do this, the consote panpots must be of the 'constant power' type - these are used on many standard consoles. The compromise between constant power and constant voltage used by several manufacturers (Soundcraft, for example) also works very effectively. Constant voltage types are not recommended. To determine which type your console uses, meter the sum of the left and right stereo bus. Pan a constant level tone across from left to right. If the meter reading at the centre drops by 6 dB you have constant voltage types. Constant power types will show a 3 dB drop, and 'compromise' designs will show a drop of about 4-5 dB. The Converter unit will work successfully if the drop in the centre is less than 6 dB: if you have constant voltage panpots they can be modified by your maintenance department; alternatively you may require two or three Pan-Rotate units. The Converter requires five inputs which are simply derived from the console as four groups plus an auxiliary send. There are in fact two independent and identical sections in the Converter so that two sets of signals may be routed in this way, giving two B-format outputs independent of each other. We will consider only one half of the unit here, therefore. The unit assumes that you can pan between odd and even groups. Let us assume that you will use groups 1-4 and Aux 1. Panning across a quadrant is achieved by routing to two of the groups and panning between them. Thus routing to 1 and 2 will pan across the front quadrant North-West to North-East; 2 and 3 will pan across the East quadrant; and so on. Aux 1 should be set to postfade on the desired channels, and the level of the send pot on each channel should be set so that the aux level is the same as the level from the direct channel output, postfade. Typically, this wilI be achieved by setting the Aux 1 master level control to full and the channel send pot to about 6 on a scale of 10 (this is the setting for a Soundcraft 2400 console). The Aux setting can also be done by ear: decoding the soundield, route a channel to group 2 only (either by paning hard right, or by routing only to group 2 with the desk panpot switched out). Set the Aux 1 master level to full. Now fade up the channel with the aux send on the channel set at zero. The sound will emerge from the monitoring (speech is a good signal to use for this), but it will not have any clear direction. Increase the channel aux send level. As you do so, you will notice that the sound will gradually be drawn towards the right front (North-East). At a certain point, it will be accurately localised 45 right. Beyond that setting, the sound will tend to be drawn to centre front. By experiment, find the setting at which localisation is best, and set the Aux 1 sends on all the desired channels to this level. The Converter is then set up. Good monitoring is essential to success with an Ambisonic presentation in the field and in the production studio. The concept is very straigthforward, but a few points must be observed for best results. Just as you would not expect very good results from a stereo system which has a large speaker and amp on one side, and a small one on the other, so it is with Ambisonics. Do not expect accurate images from a playback setup with one pair of large monitors at the front and a couple of transistor radio speakers at the back. You will get something out of it, which may well be interesting, but it will not be 'right'. Try for four identical speakers and amps for best results. Loudspeakers should be arranged in a rectangle, with the sides in any ratio up to 2:1. Speaker positioning is usually a matter of 'put them where you can': within this kind of constraint, try to get them in some kind of rectangle. Point the speakers in toward the centre of the listening area, so that opposite speakers face each other: this will ensure that most of the listeners will experience some top end, where most of the localisation information occurs (just as in stereo). Don't use speakers which are highly directional at high frequencies, or large audiences won't hear ordinary stereo either! Ensure that all four channels of amplification are set to the same level, and, of course, that all wiring is in phase. Having set up speakers and amps, pace out the sides of the rectangle, and set the layout control to the appropriate ratio. There is a 'test' button on the (A+DR) decoder; when pressed, it routes the same source to all the outputs. If you want to be particularly accurate, you can send tone through the system and measure the SPL or the speaker terminals with a meter and set the amp drive levels up accordingly. Otherwise, simply stand in the listening area and see that the sound appears to be 'in your head' on the decoder test position around about the middle of the listening area. Ambisonics is far less critical about speaker setups than its designers imagined, and acceptable decoding occurs with all manner of things wrong, so don't worry if you can't get the speakers exactly in a rectangle or exactly at the same height, etc. It will probably work fine. Speaker polarity, on the other hand, is vital, just as it is for good stereo imaging. The source material should be routed to the decoder as appropriate. In the studio, UHJ is easily monitored by plugging the decoder inputs to the monitor speaker output of the console. If you are using a speaker setup other than your main monitors for Ambisonics, it may be helpful to feed the decoder from the auxiliary monitoring or studio playback source on the desk. That way you can check stereo on your main monitors at the press of a button, if that is important. With B-format, you will need to derive a three-channel feed which allows you to monitor the output of the control units and the 4-track recorder for playbacks. If your console is set up for 'Quad', this will be straightforward. On-site, simply route the tape channels to the decoder UHJ or B-Format input as appropriate. A selection of controls are provided on the decoder for different applications. 'Bypass' will route the input signal to the front two speakers only: useful in the studio, as it means that normal monitoring in stereo is restored merely by pressing this button. When the decoder is switched off, bypass is automatically selected: this is a hard-wired bypass and the signal only passes through relay contacts. Another button selects the distance of the speakers from the centre of the listening area. You merely set this button according to whether the speakers are more than 3 m away or not. In the studio, they are usually closer; on-site they may be further away. The layout control, already discussed, sets the decoder up for your particular speaker arrangement. Note: The settings of these two controls vary from one listening environment to another. As a result, good decoding will not be achieved if you try recording the decoder outputs instead of B-format or UHJ at the production stage, unless the speaker arrangements are identical in the recording and replay environments. For best results where the speaker layouts are significantly different, a decoder must be used on-site! For Ambisonic decode, you simply select the appropriate button on the decoder: UHJ if the source is 2-channel UHJ; and B-format if the source is 3-channel B-format. If the wrong selection is made, nothing will be heard. The source material must be connected to the correct input on the decoder. There is one final control, called 'forward preference'. This is usually set to minimum. However, if you wish to emphasise the front of the layout, increase this setting until you are happy with the results. This should only be done with care, as there is a slight degradation of definition at the rear if this control is increased. It should be used only if there is a tendency for the rear information to come across too powerfully in the particular auditorium because of acoustic peculiarities and the like. It should not be necessary in the studio. Some decoders have an additional control, called 'super stereo'. This usually consists of a 'stereo' button and a rotary control. If you make an Ambisonic decoder a standard part of your on-site equipment, these facilities enable the playing of ordinary stereo through the Ambisonic 4-speaker system. Ordinary stereo information is fed into the unit, and the stereo width control enables the spread of the image to be increased from mono to about 180 degrees. This facility is not unlike that of the Transcoder in this respect: it enables you to 'enhance' an ordinary stereo soundtrack if you have four amps and speakers available and the decoder. Note: the contact information given here is no longer valid and is included for completeness. All the production equipment described in this article is available from Audio & Design Recording. They will be producing decoders shortly. Decoders are also available from Minim Electronics, and a number of other manufacturers. Equipment is available for purchase, or in limited quantities for free evaluation from the Ambisonic Technology Centre, 16 North Street, Reading, Berkshire RG1 7DA, UK. Tel: 0734597083. Telex: 848722. The ATC should also be contacted for information on Ambisonics, including reprints of useful articles, and details on demonstrations of the system. The Keith Mansfield Ambisonic album, Contact, is available on tape or disc in 2-channel UHJ format from KPM Music, 21 Denmark Street, London WC2H 8NE, UK. Tel: 01-8366699. KPM can also arrange for Ambisonic remixes of KPM material to be produced at normal studio rates, and can refer enquiries on Ambisonics to the appropriate sources for information or equipment. KPM will be producing further Ambisonic albums in the future.